preciousjules1985	Action Alert, Advertising, Against Animal Cruelty, Animal Abuse & the Law, Animal Australia, Animal Breeders, Animal Control, Animal Cruelty, Animal Emotions Behaviour & Instincts, Animal Equality, Animal Found Dead, Animal Health & Welfare, Animal Husbandry, Animal Investigator, Animal Neglect, Animal Severely Beaten, Animal slaughter, Animal Torture, animals, Animals Australia, Animals denied food & lack of care, Animals Denied Treatment After Injury, Australia, Australian Animals, Congress, Contaminated, Desperately Need Donations, Disability, Disease Outbreaks, Donations, Face Book, Food Chain/Products, Freedom of Information Act, Gross Neglect, Health and wellness, Human Greed = Animal Cruelty, Live Export, No Enforcement Of Animal Welfare, Profit Through Animal Abuse, Research, Sadistic, Should Get Prison Term For Offence, SICK POS, Slaughter House, Slaughtered while conscious, Television, VERY GRAPHIC CONTENT, YouTube	Animal rights, Animal welfare, Animals Australia, Cruelty to animals, Live export	Comments Off on Animals Australia: Help Us Launch An Emergency Broadcast For Animals. GRAPHIC MEDIA INC.
Change his fate. 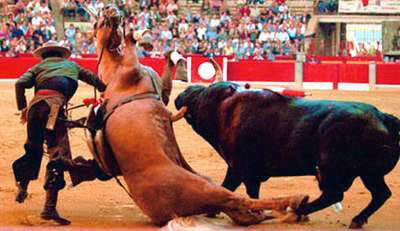 Help expose live export sledgehammering on tv. It’s been 6 days since we exposed the brutal reality of live export to Vietnam: terrified animals having their skulls smashed with sledgehammers. That means young calves like him will grow up to risk the very same horror: sledgehammered to death in a filthy slaughterhouse. The ‘lucky ones’ die quickly. The unlucky ones feel everything — blow after agonising blow. (VERY GRAPHIC… VIEWER DISCRETION ADVISED; AT THE END OF THIS PAGE – Watch a video TAKEN ON-BOARD AN EXPORT SHIP BY A VET, after it was uploaded she lost her job!!!!). These animals’ harrowing stories are sending shockwaves around the world. Our investigation made headlines in 34 countries. Our Prime Minister expressed his ‘shock’ and ‘disgust’. But it wasn’t followed by any meaningful action. 10 days out from an election and the last thing political leaders want is for their complicity in animal abuse to be thrown into the spotlight. With your help, that’s exactly what we’re about to do. We urgently need to send a message to decision-makers that their promises and platitudes aren’t good enough. That for every animal who suffers for this industry, for every day a terrified steer is at risk of brutal sledgehammering — we will keep fighting for them. 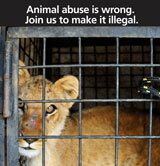 Please help us disrupt the election campaign with an emergency broadcast for animals. We have just 48 hours to secure pre-election air time. Can you help us reach our goal? We don’t just have our sights set on TV — with your help we will target politicians when they read their news online, too. For too long the odds have been stacked against animals, but right now we have a rare opportunity to hit the live export industry where it hurts. Help us seize it. Even a small donation today can make a difference. In whatever way you choose to help animals, thank you. Please donate to an emergency broadcast. It’s not the first time Animals Australia investigators have exposed the horrific practice of sledgehammering animals to death in the live export trade. After 12 months, terrified animals are still having their skulls smashed on a nightly basis. Nothing Barnaby Joyce (the Agriculture Minister) has done to date will stop this horror continuing. With just 9 days until the election, we need your urgent support to disrupt the election campaign with an emergency broadcast for animals. Help us get this online and on TV. "OMG...this is beyond sickening, I can't see the dog walking willingly into fire, so she was either burnt or doused in some type of chemical; on purpose. I pray they catch the scum that did this & will keep her in my prayers, in the hopes that all her pups make it & she finds a forever loving home!" 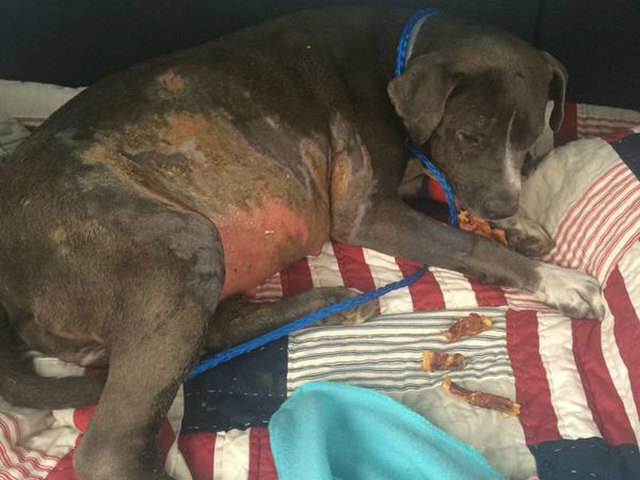 WEST PALM BEACH, Fla. – A pregnant dog that was severely burned is doing much better after being taken in by a local animal rescue group. “Someone did something unkind to this very sweet dog,” says Donna Casamento with Big Dog Ranch Rescue. It’s something so unkind, it’s horrific to view. Nina, a terrier mix, has second to third degree burns on her chest, all the way down to her legs. “It’s been a very very sad situation. We weren’t sure when we first got her how the burns happened,” said Casamento. But Donna thinks Nina’s burns may have been intentional. And what makes this worse, she’s pregnant. Now the race is on to save the unborn dogs while Nina recovers. “It’s somewhat difficult for us to tell exactly if the puppies are still alive yet,” Casamento said. The hope is eventually to find her and her babies, a loving home. “In spite what she’s been through, all she wants to do is sit with her head in our lap and get love. This is a great dog,” she said. Vets say once Nina becomes comfortable, they’ll be able to perform an ultrasound to see if the puppies are alive. They’re asking the community to help with donations for Nina’s care. Find out how you can help at their website, http://www.bdrr.org/ . Miami-Dade animal rescue is investigating the case. A PUPPY ‘tortured’ in Limerick has found a new home in England. The public have raised over €3,400 for George, a five-month-old Terrier, to pay for veterinary operations. 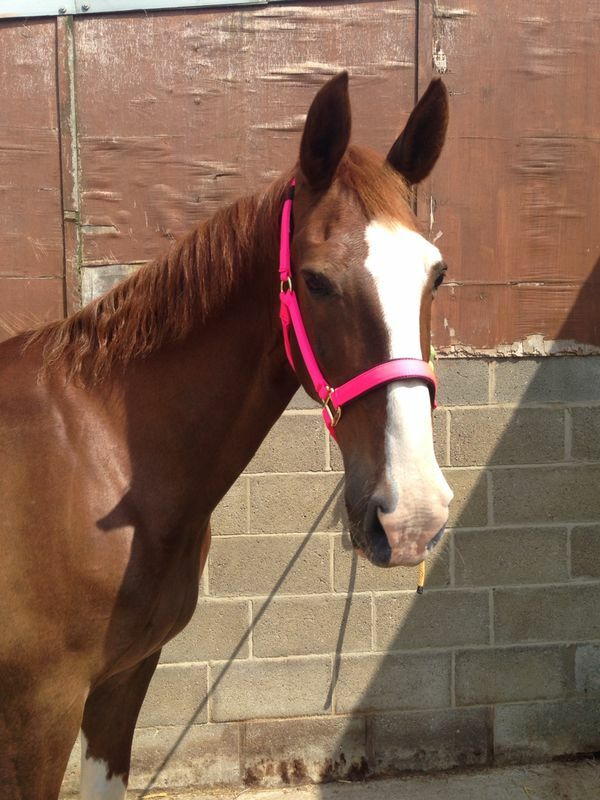 He was rescued by Limerick Animal Welfare (LAW) after being thrown over a wall in Southill. George had a broken pelvis, an untreated eye injury, both hips broken, ear tips cut off, burns to his stomach and his whiskers singed off. LAW’s Kilfinane sanctuary manager, Marie Quirke said he had been “tortured so badly that he is terrified of people.” In the past three weeks he has been nursed back to health by LAW staff. “George came home on Saturday from Noah Veterinary Clinic in Baldoyle where orthopaedic surgeon Billy McCartney performed an operation on both his hips to stabilise them using pins. He will need to be on strictly confined rest for four weeks to allow the healing process to work. He is on antibiotics and pain relief. Little George will need to have check-ups with John O’Dwyer, a vet in Henry Street to make sure everything is going well,” said Marie, who wished to thank Mr McCartney, all at Noah, Mr O’Dwyer and everyone who contributed to George’s veterinary care fund on their Facebook page. “Any money over and above the cost of George’s treatment will go towards two other dogs in our care who also need expensive operations to injuries sustained in road traffic accidents,” said Marie. After a terrible start to life for George is going to live in the lap of luxury for the rest of his days in England. Animal lover, Coral Plunkett, got in touch with LAW. 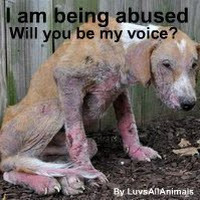 “Having read the cruelty this little man suffered and the battle to recover which faced him I didn’t think twice. I contacted LAW and offered him a home with Matt, Connie and Hannah, also adopted from LAW. “After speaking with Marie there was no hesitation on my part in naming him George, after St George. Unfortunately George is one of many, you could say he is one of the lucky ones. The work undertaken by LAW is just amazing and they are totally reliant on the generosity of people, so to have raised over €3,000 for George is just fantastic. Offering your heart and your home to a rescue animal is one of the best investments you will ever make, it will be repaid with love, loyalty and commitment,” said Coral. The proposed sale of a figurine of “Puppy Doe,” a young pit bull mix who Massachusetts authorities say was tortured by a man later found in a New Britain hotel room is drawing the ire of animal welfare advocates. The Puppy Doe case drew national media attention after the severely injured dog was found in Quincy, Mass. and had to be put to sleep due to the torture that was inflicted on the young female dog named Kiya by one of her former owners. Radoslaw Czerkawski, 32, of Quincy, Mass, pleaded not guilty in December to 12 counts of animal cruelty, and one count of misleading a police investigation in the case after he was found in a New Britain hotel room in October. Czerkawski is also wanted for larcenies involving a New Bedford, Mass church. He is currently being held without bail as a flight risk, according to the Norfolk State’s Attorney’s Office in Massachusetts which is prosecuting the Puppy Doe case. But animal welfare advocates who have been raising money in the dog’s name and staging peaceful protests outside the Norfolk courthouse when Czerkawski appears are appalled at the idea, said Deanna Terminiello of Leominster, Mass. “I was shocked,” Terminiello said when she saw Facebook posts promoting the product. “To see that made me sick that someone is trying to make a profit off of a dog that was tortured.”Several other animal welfare advocates also posted similar comments on Terminiello’s Facebook page, “The Truth About The Puppy Doe Vigil,” which has close to 300 members. The figurines which will go into production this week can be purchased for $29.95. Vicale, who will only produce 2,000 of the resin statues, will donate 10 percent of the profits between the Animal Rescue League of Boston, which is involved in the Puppy Doe case, and the national ASPCA. A spokesperson for the Connecticut state Humane Society of the United States which offers rewards in animal abuse cases and help in prosecuting animal cruelty cases applauded the sale of the figurines. 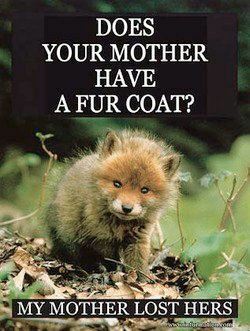 “It does seem like a well intentioned effort to raise awareness and help fund groups that support animal welfare,” said Ami Hornish, the director of the Connecticut chapter of the HSUS. But Terminiello, who along with others helped raise $2,500 to donate to the Quincy animal shelter after the dog’s death and who attended a protest in December at the courthouse called the sale of the figurines “sickening.” “This is not about fame, it’s not about fortune,” she said. “Anyone who would profit off this dog is unimaginable.” David Traub, a spokesperson for the Norfolk State’s Attorney’s Office said Czerkawski is due back in court Feb. 11. The Dallas Safari Club has seen its organization in the cross-hairs of a worldwide debate since first announcing its plans for the execution of a highly endangered rhinoceros. On January 11, 2014 at the Dallas Convention Center in Dallas, Texas, they will be auctioning the rights to kill an endangered Black Rhinoceros and are declaring this hunt a “heroic conservation” effort, the Dallas Safari Club and its supporters are attempting to deceive a gullible public into believing this hunt isn’t simply the slaughter of a rare species of rhino. The club’s actions and rhetoric dares to make palatable what most would deem unjustifiable—killing an animal facing extinction. Some ‘lucky’ hunter-with a fist full of cash, gets to kill an endangered Black Rhino. “It’s going to generate a sum of money large enough to be enormously meaningful in Namibia’s fight to ensure the future of its Black Rhino populations,” Carter says. The money, in reality, may go to an already corrupt government, one that is willing to turn a blind eye to the destruction of its own resources for money. At the time of this writing, there is no clear indication who will get the money and for what conservation purposes. Government corruption In Southern Africa is a well-known issue and regularly documented by various media sources. “Conservation,” is the organization’s only argument to garner support, even within its own community. This is simply a selfish attempt to ensure its members can continue hunting rhinoceros and other species years from now. This auction to hunt a Black Rhino is NOT conservation of a species. There is nothing ethical or heroic about it. It is a deliberate attempt to mislead the general public and disguise the true motives of the Dallas Safari Club and its members. According to Louisiana conservation attorney John J. Jackson, who said he’s been working on the auction project with federal wildlife officials, the hunt will involve one of five black rhinos selected by a committee and approved by the Namibian government. The five are to be older males, incapable of reproducing and likely “troublemakers … bad guys that are killing other rhinos,” he said. These animals are farm-raised around humans and cared for by humans only to be killed by rich hunters in what has been coined as “canned hunts.” This is simply a method that allows them to farm more for harvesting later. This auction is nothing more than abuse of Africa’s natural resources to the highest bidder. No ethical or moral motive drives the hunt club’s actions. What DSC touts as conservation, we label destruction of a nation. Three rhinos were poached during our recent visit to a rhino farm. Is trading their horns the only way to save them? WARNING: contains graphic images. Yes he is correct–the hunt may be a hero in the hunting community. But it has no conservation value other than the additional killing of rhinoceros and other species by rich Americans. This guise of “conservation” is not new but seems to be the only justification the group has. The individuals who participate in these hunts are rich Americans and Germans-typically millionaires who could very simply donate towards the care and keeping of endangered species rather than killing them. If this club wants to be seen as ‘heroes,’ and it has such a concern for conservation, it could easily petition its rich members to save these animals by donating money, to be used towards conserving the species. So we continue to ask–how is handing over a sum of money for the rights to kill an animal that is nearly extinct the most sophisticated management strategy, when most South African countries are banning Trophy Hunting? These countries have found that it just does not work. 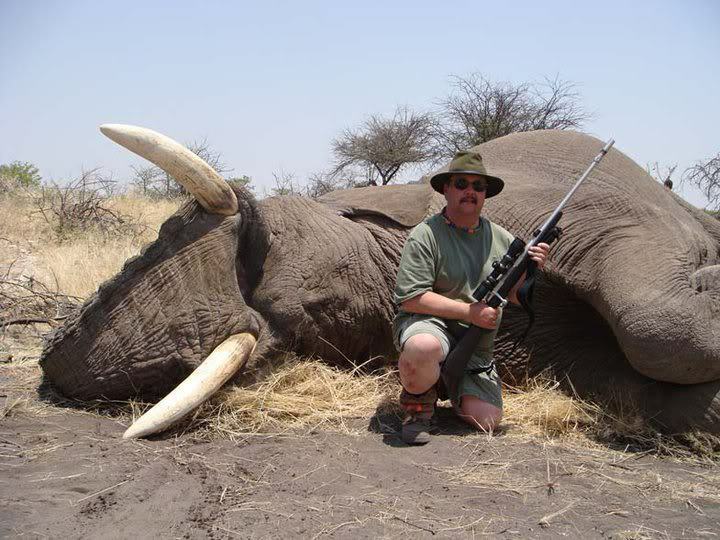 There is a comprehensive list of researched and confirmed reasons that clearly explain why trophy hunting is not a good conservation method, even if cash is generated in the process. And, in fact, the numbers of threatened species have rapidly declined since the Hunting Lobby groups won the fight to continue “their conservation efforts”. The real motive for this auction and hunt is not for the survival of the rhino species, and protection of the species’ inherent majesty and ecological importance, but rather for the expensive blood-lust thrill of killing. This opportunity is available only to an elite group of power hungry wealthy people to “conserve” a commodity for the continued planned, organized, and highly profitable execution of wildlife for fun! 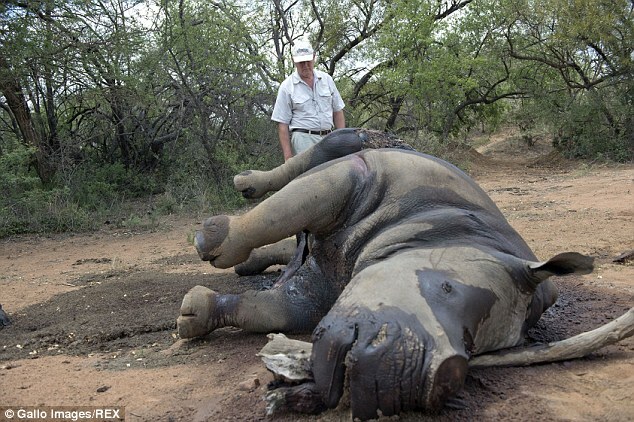 The rhino hunt is reportedly going to take place at Mangetti National Park, which is located in northern Namibia. Quotes from the above website! “Every single rhino is under the threat of poaching at the moment,” said Director of the World Wildlife Fund’s Species Conservation Program, Barney Long, to Antara News. However, the WWF also sent a letter to the FWS in 2009, advocating for the removal of non-breeding males. British conservation charity Save the Rhino has advocated for proactive hunting while still acknowledging the minor details in play. Save the Rhino has also argued positively for the auction being held in America rather than remaining within Namibian boundaries. Rhino Wars- The Silent Slaughter is a short documentary about rhino poaching in South Africa, which has become a pandemic. If rhino poaching continues at its current rate, all rhinos will soon be extinct. It is imperative that more awareness needs to be created about rhino poaching, so that governments will act with greater resolve and political will to combat poaching. This documentary was filmed in South Africa in June 2012 in partial fulfilment of my Masters dissertation and is dedicated to Lawrence Anthony for his wonderful work in conservation and for doing everything in his power and beyond to save the rhinos. 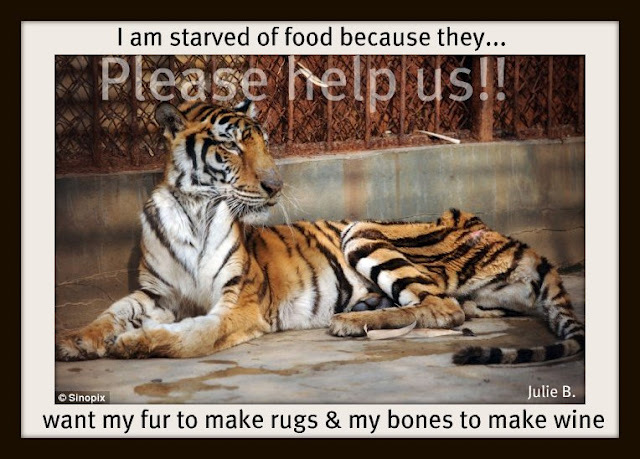 “Please Donate what you can to help this cause before midnight. I’ve donated only $10, it’s all I can afford; but every penny helps! Without those who risk their own lives, to capture the abhorrent abuse & bring it to the attention of the public, farm animals will carry on being abused in the most horrific ways possible & the public will continue to be hood winked…i.e none the wiser! Why do you think suppliers & buyers of meat products are trying to introduce Ag-Gag laws? 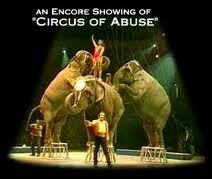 Once the abuse is captured, their business’s are over!! Please help Abby today. By making a special tax-deductible donation today, you will support the vital work of Mercy For Animals‘ brave undercover investigators who expose cruelty to animals like Abby on factory farms and fight to bring their abusers to justice. Thanks to a kindhearted MFA supporter, all donations made by midnight on December 31 will be matched – dollar for dollar – to a total of $100,000. With this special opportunity, your gift will go twice as far in helping us build a kinder, more compassionate world. On behalf of Abby, thank you. Meet Abby. She Needs Your Help. Meet Abby, a downed cow who was kicked, whipped, and beaten on a dairy factory farm. Hear her story from “Scott,” the undercover Mercy For Animals investigator who is fighting to protect Abby and the countless others like her suffering on factory farms across America. December 10, Life for a dog dubbed “Francis,” has been hard. When the biting, bitter cold hit St. Louis, Mo., what was formerly difficult became nearly life-ending. Rescuers with Stray Rescue of St. Louis came upon Francis on Tuesday; the beleaguered senior dog was clearly in distress and in need of immediate help. Francis’ skeletal body was gently lifted from the frozen ground and he was carried to a vehicle which would transport him to an emergency veterinary team. As the temperatures dip below freezing, our worries rise. During this extreme weather, the deck is stacked against even the healthiest of street dogs. Sadly, there are also other, more susceptible four-legged friends out there – senior dogs and puppies who really struggle to survive in the elements. As soon as Randy and Donna knew he was in the best hands possible, they were out the door and back in the rescue Jeep again. The elderly shepherd, who is estimated to be 10 years of age, was placed on I.V. fluids, provided with oxygen and warmed with heated blankets. The rescue agency captured video of Francis’ first moments at the veterinary hospital; it is painfully evident that the dog is defeated, exhausted and on the brink of nearly giving up altogether. Francis is not yet out of the woods, but today, for the first time in far too long, he is warm, safe and receiving the compassion and kindness that he deserves. Randy and Donna hit the streets like they do every day and, with the temperatures turning bitter cold, their typical sense of urgency was even greater. Responding to another call, they turned down an alley. As they drove, Donna shouted to stop the car. They simultaneously saw the frigid, defeated body of a Shepard Mix, and Randy jumped out of the car – knowing right away that this dog needed to get warm… immediately. Randy named him Franics, as in Franics of Assisi, patron saint of animals. This sweet old dog needs all the help he can get. Rushing back to the Stray Rescue Trauma Centre, Randy called ahead to alert the vet staff about what he was bringing back.Watch the video below to see an intimate look at Francis arriving at the shelter and our amazing vet team jumping into action. Please keep thinking positive thoughts for Francis, and we will post updates as they become available. You can make a difference right now by contributing to his medical care, and the medical care of future rescues as we fight to save as many as possible this winter. During this critical time, the need is greater than ever. Thankfully, because of the generosity of the Stray Rescue family, hope is never far away during this season of giving. Please click the link below to donate to The Stracks Fund, our emergency medical fund.